Before he discovered the Evelyn Wood method, our instructor Dan Warner was a different person. As an English major in college, he avoided classes which required term papers. He couldn't take all the extra reading he knew would be required before he sat down to write. "Even if only four or five extra books were necessary, I actually felt physically sick when I'd sit down to read the first book," he recalled. "I also knew I'd fall asleep trying to read." But after he took the Evelyn Wood course, his academic life, including his paper-writing, was transformed. After spending a full day finding information in the card catalogue and periodical guide, he ended up with 104 books and 78 magazine articles as sources on his first post—Evelyn Wood paper! "If at any point in this process a thought came to my mind that represented a developing personal opinion or insight, I'd jot it down, write 'Me' on it, rip it off and throw it into the bag with everything else," he said. Finally, when he had compiled all his research information, he dumped his research materials out on the floor in his room and began sorting the notes and papers into clus ters, according to the main topics on the master recall pattern. Dan formulated a brief master recall pattern so that he would have a clear statement in front of him of what the main topics in the paper would be. Also, he determined the order in which he wanted to discuss each topic. He placed several blank sheets of paper at the beginning and end of the connected notes and also some blank paper between each of his main topics. This way, he had space to draft a rough introduction and conclusion and also to include transition sentences or paragraphs between the main sections. So what Dan ended up with was a continuous sheet of paper about twenty feet long. Then, to make it more manageable and portable, he rolled it up into a scroll. What he had as a result of this stringing together of his notes was a kind of first draft of the manuscript. Finally, Dan went through his note-scroll—i.e., he "post-viewed" it—to see if everything was in order. At this point, he also jotted in an introduction, his transitions, and a conclusion on the blank sheets of paper he had inserted. There are a number of advantages to this scroll technique. Suppose, for example, that you forget to include any facts or observations. Or perhaps you have discovered some material at the last minute, after the scroll has already been constructed. In these situations, all you have to do is take some scissors, clip through the scroll at the appropriate point, and insert the new material with staples or tape. Also, by using a scroll, you can put your research mate rials in precisely the order you want for your first draft. In fact, as I've already indicated, the scroll actually forms a kind of first draft. Finally, when all one's notes are attached in sequence, there tends to be less rummaging around for misplaced materials as the drafting is being done. Furthermore, it's relatively easy to transport a scroll to a library or some other facility outside your room and do work there. Now, with his scroll before him, Dan proceeded to type out his first draft. He began at the top of the scroll, where he had jotted in the introduction; unrolling the notes, he moved steadily through to the conclusion. His draft of this term paper was forty pages long, complete with footnotes and bibliography. How long did it take him to write this first draft? Barely ten hours. That's four pages an hour—record time, when you consider that two to three pages an hour is often considered a good pace by professional writers. "It was really just a matter of typing up what I already had on paper," he explained. "I didn't have to worry much about organizing the paper, inserting transitions or other such things. Those problems had already been dealt with as I was stringing my notes together. That scroll really did constitute a first draft for me." At this writing pace, Dan would have completed the first draft of a twenty-page paper—the length that Beth wrote in our previous example—in only five hours. Or a ten-page paper could have been done in two and a half hours. You can see the potential with this scroll approach, which is merely a fine-tuning of the basic supersonic paper-writing techniques that I've already described. In any event, whichever method you use, the main idea is first to overview, preview and read the research materials at your best speed. Then, you should spend adequate time organizing your notes and recall patterns in some fashion. The better job you do during this reorganization and master recall pattern phase, the more quickly your drafting will go. That was the beauty of Dan's scroll technique. Certainly, writing the paper requires time and thought. But effective writing is much like effective reading or studying: The more thinking and organizing you can do in advance, the easier it will be to reach supersonic speeds, whatever the academic challenge happens to be. 1. Establish a point of view. 2. Identify specific research materials. 3. Compile all your information. 4. Reorganize the information into one master recall pattern. 5. Write the first draft. Prepare the final draft. All the skills you've learned so far—including the hand motions, the layered reading process, and the various preparatory procedures for effective study—have been moving you inexorably toward this point. 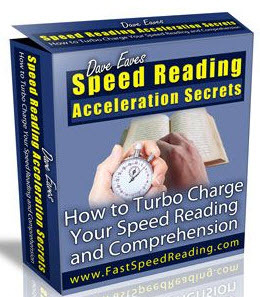 Now, you're ready to put it all together, to see just how fast and efficiently you can read and study. Anna. As a junior in high school, Anna's reading rate was 330 words per minute, and her level of comprehension was 65 percent. She had become frustrated with her performance at school, which ranged from B-minus to C-plus. So, on her own initiative, she enrolled in one of the Evelyn Wood courses. After only about one month of practice, her regular read ing rate had risen to 1,440 words per minute, with a comprehension level of 85 percent. Even more important, her grades at school began to get better. She began to do much better on her tests, with grades consistently in the A-minus to B-plus category. By the time Anna had finished her junior year, her mother had become more than curious about her marked academic improvement. "This is not the Anna I know," she told one of her friends. "She's always been one who was content just to get by. Maybe she's finally growing up." But then, her mother began to put two and two together: "You know, I think it may be this reading course she's been taking. That seems to have changed things completely." After Anna confirmed this analysis, the mother hit on a bright idea. She knew that her daughter had turned in a mediocre performance during her first two and a half years of high school, and those low grades were bound to work against her as she applied to colleges. So she suggested—and the school guidance counselor supported—this novel strategy: Anna would write to her prospective colleges explaining how her study habits and performance had been transformed as a result of the Evelyn Wood methods. Also, the mother and counselor asked Anna's Evelyn Wood instructor to write a separate letter to the various college admissions committees. The results were highly encouraging: The majority of the admissions officers said that they would take the changes in Anna's study habits into account in considering her admissions application. As a consequence, she gained admission to at least two schools that she would ordinarily not have expected to enter. Brian. A seventh-grader, Brian, was assigned a two-hundred-page paperback novel to read for a test. The test was scheduled in two weeks, and Brian was worried about his ability to handle this extra piece of work. Like that of most children his age, his schedule was loaded up with other homework and extracurricular activities. Fortunately, however, Brian had been taking an Evelyn Wood reading and study course. As a result, he had acquired some important skills that enabled him to complete the reading assignment with relative ease. Reading at a rate of about 1,000 words per minute, he completed the book in a total of less than two hours—and he did it on the same day that the teacher had assigned the book. The entire elapsed time even included the drawing of a rather complete slash recall pattern. Then, on two or three evenings in the next two weeks, Brian reviewed his notes, reread some sections of the book, and added appropriate facts and comments to his recall pattern. By the time test day rolled around, Brian was completely prepared. He received an A on the test. Max. Eventually, Max became the star pupil in a course given by one of our instructors, Carol Romaniszak. But he didn't by any means develop his stellar reading and studying capacities overnight. In fact, at the beginning of the program, Max complained several times, "I really don't get this stuff. I don't understand how I'm supposed to increase my reading speed this way. It just doesn't feel right to me." The Evelyn Wood program can be like that at first: Some of the concepts may seem quite strange to new students. I liken our techniques to the first steps in learning skiing or tennis. During the first few tries, you may fall down, or miss the ball, or whatever. But eventually, for those who stick with it, these "strange" new sports become more familiar— and expertise and enjoyment increase. Max started the program reading at a rate of 300 words per minute, with only 48 percent comprehension. But he had made up his mind to work hard, and every time the instructor introduced a new concept that he didn't quite understand, he'd stop her and say, "Wait, wait a minute. Could you go over that again?" Like a bulldog, he'd hang on to each skill that he found difficult until he finally understood it and began to master it. Then, invariably, he'd announce, "Yeah, I got it now. I've got it cold!" In fact, Max learned everything so well that by the end of the three-week course, he had increased his reading rate to an incredible 2,927 words per minute. And his comprehension had soared to 92 percent! These students, and many others like them, have experienced phenomenal improvements in their reading speeds and comprehension scores in our course. Furthermore, high achievement in the Wood program is consistently reflected in higher marks in schoolwork. But I want to be completely realistic here. It's true that most students can see dramatic improvements in their reading and recall abilities with less than a month of intensive work. Commonly, reading rates increase from about 250 words per minute at the beginning of the course to 1,000-1,200 words per minute or more at the end. On the other hand, these skills are just that—skills. A .skill of any type, intellectual, social or athletic, will atrophy unless it's maintained with regular nurturance and practice. You can talk to many of our instructors and they'll tell you that they can read at their highest rates only when they're "in shape," or "in training," or "in practice." Earlier in this book, I described some of the speed plateaus that can be reached through subvocal linear reading. As you may recall, there is a kind of supersonic subvocal barrier at about 800-900 words per minute for this type of reading. To break through this barrier, it's necessary to begin to read vertically and visually. This process becomes more possible as you use the various vertical hand motions, layering methods and other techniques that have already been described. What can you expect in terms of speed and experience after you do break through the subvocal barrier? Here are some of the possibilities.